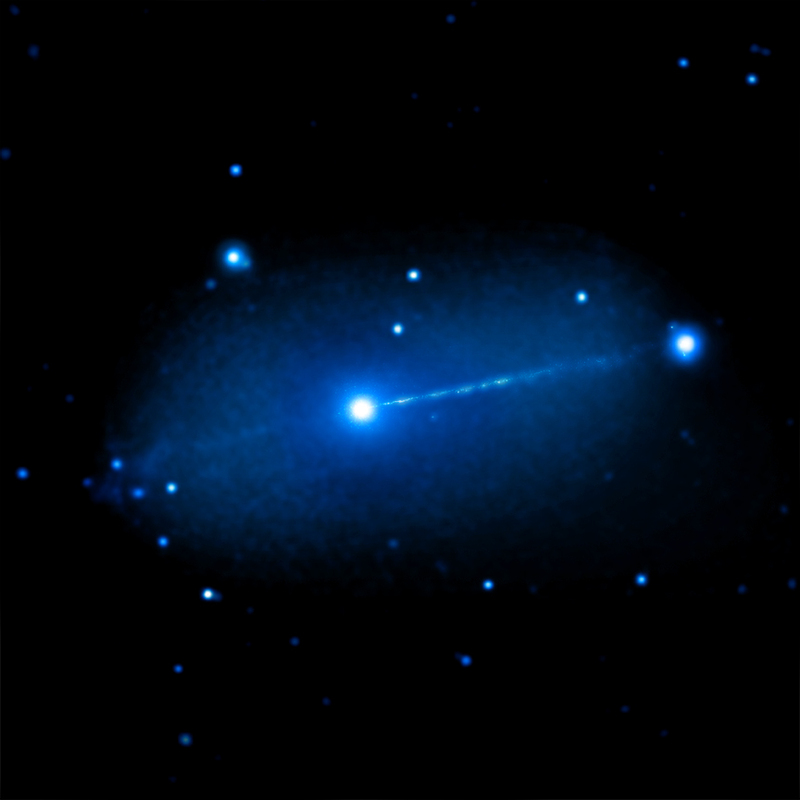 A giant jet spanning continuously for over 570,000 light years is seen blasting out of the galaxy Pictor A. 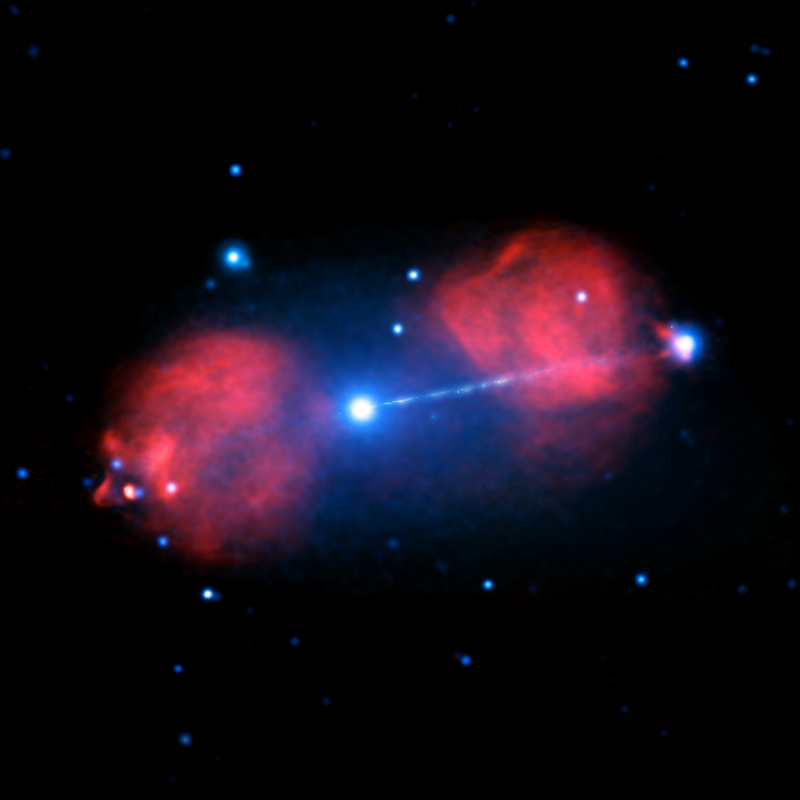 A new composite image shows this jet in X-rays (blue) and radio waves (red). In addition to the main jet, there is evidence for a jet moving in the opposite direction. Chandra observations at various times over a 15-year period provide new details of this impressive system. The Star Wars franchise has featured the fictitious "Death Star," which can shoot powerful beams of radiation across space. The Universe, however, produces phenomena that often surpass what science fiction can conjure. To obtain images of this jet, scientists used NASA's Chandra X-ray Observatory at various times over 15 years. 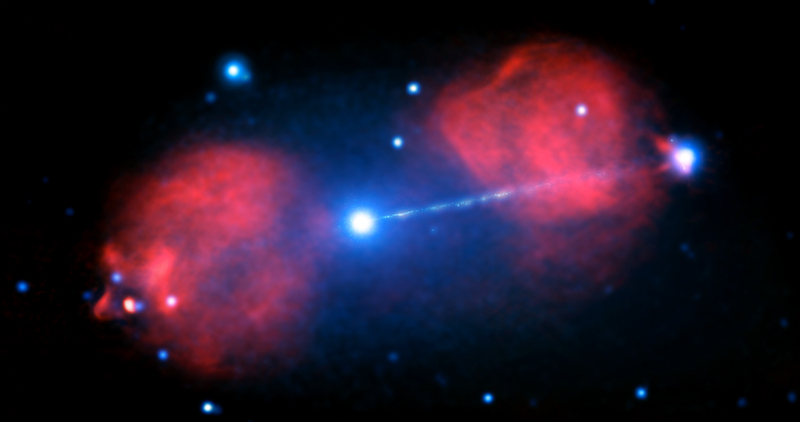 Chandra's X-ray data (blue) have been combined with radio data from the Australia Telescope Compact Array (red) in this new composite image. The jet [to the right] in Pictor A is the one that is closest to us. It displays continuous X-ray emission over a distance of 570,000 light years. By comparison, the entire Milky Way is about 100,000 light years in diameter. Because of its relative proximity and Chandra's ability to make detailed X-ray images, scientists can look at detailed features in the jet and test ideas of how the X-ray emission is produced. In addition to the prominent jet seen pointing to the right in the image, researchers report evidence for another jet pointing in the opposite direction, known as a "counterjet". While tentative evidence for this counterjet had been previously reported, these new Chandra data confirm its existence. The relative faintness of the counterjet compared to the jet is likely due to the motion of the counterjet away from the line of sight to the Earth. 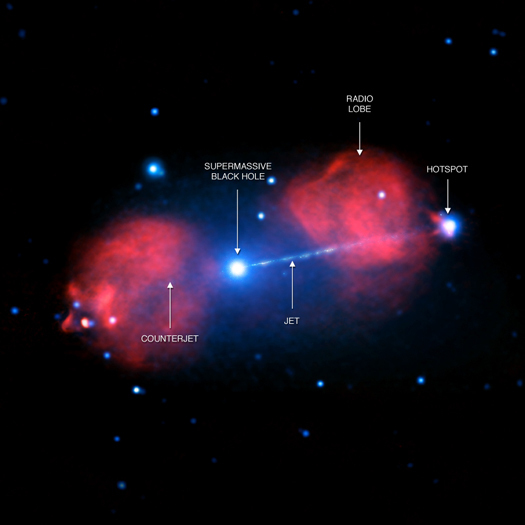 The labeled image shows the location of the supermassive black hole, the jet and the counterjet. Also labeled is a "radio lobe" where the jet is pushing into surrounding gas and a "hotspot" caused by shock waves — akin to sonic booms from a supersonic aircraft — near the tip of the jet. The researchers ruled out a different mechanism for producing the jet's X-ray emission. In that scenario, electrons flying away from the black hole in the jet at near the speed of light move through the sea of cosmic background radiation (CMB) left over from the hot early phase of the Universe after the Big Bang. When a fast-moving electron collides with one of these CMB photons, it can boost the photon's energy up into the X-ray band. A paper describing these results will be published in the Monthly Notices of the Royal Astronomical Society and is available online. The authors are Martin Hardcastle from the University of Hertfordshire in the UK, Emil Lenc from the University of Sydney in Australia, Mark Birkinshaw from the University of Bristol in the UK, Judith Croston from the University of Southampton in the UK, Joanna Goodger from the University of Hertfordshire, Herman Marshall from the Massachusetts Institute of Technology in Cambridge, MA, Eric Perlman from the Florida Institute of Technology, Aneta Siemiginowska from the Harvard-Smithsonian Center for Astrophysics in Cambridge, MA, Lukasz Stawarz from Jagiellonian University in Poland and Diana Worrall from the University of Bristol. This image is out of this World... I am speechless. About 500 million light years from Earth. Combines X-rays from Chandra X-ray Observatory and radio data from the Australia Telescope Compact Array. About 1.4 million light years across. X-rays are blue and radio red. In the constellation Pictor in the Southern Hemisphere.